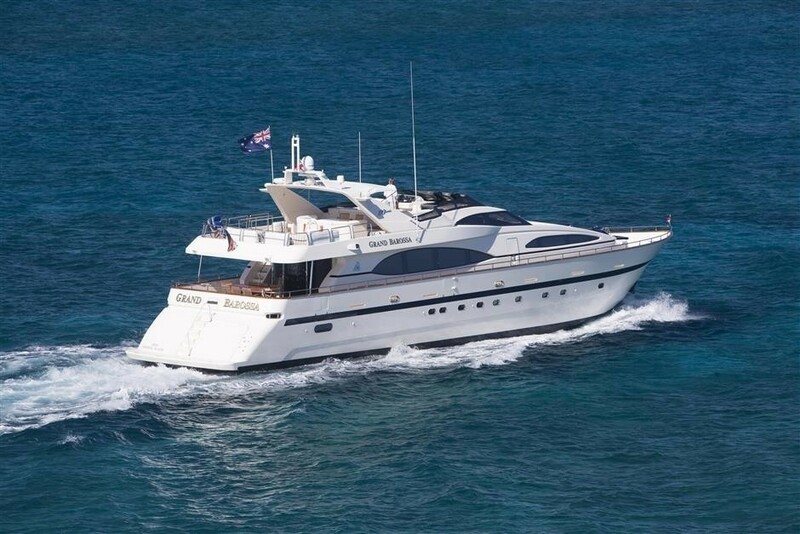 Yacht GRAND BAROSSA - Main.. 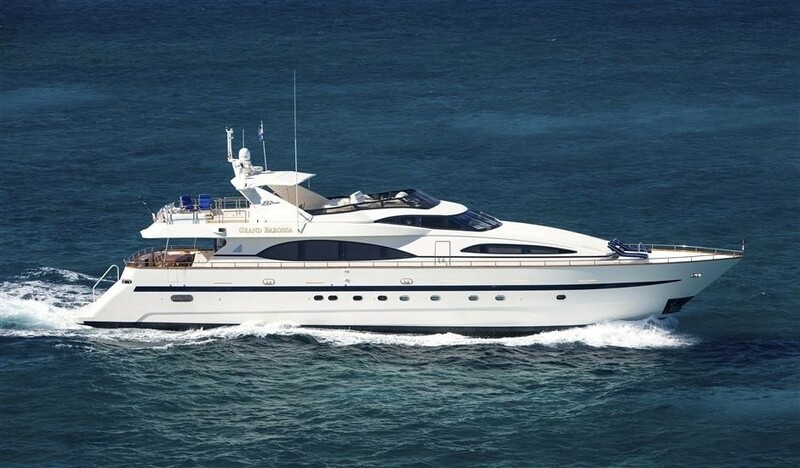 Luxury motor yacht MY MY MY (ex Grand Barossa, Melimar) was launched in 1999 by the renowned Italian shipyard Azimut and measures 30.48m (100ft). 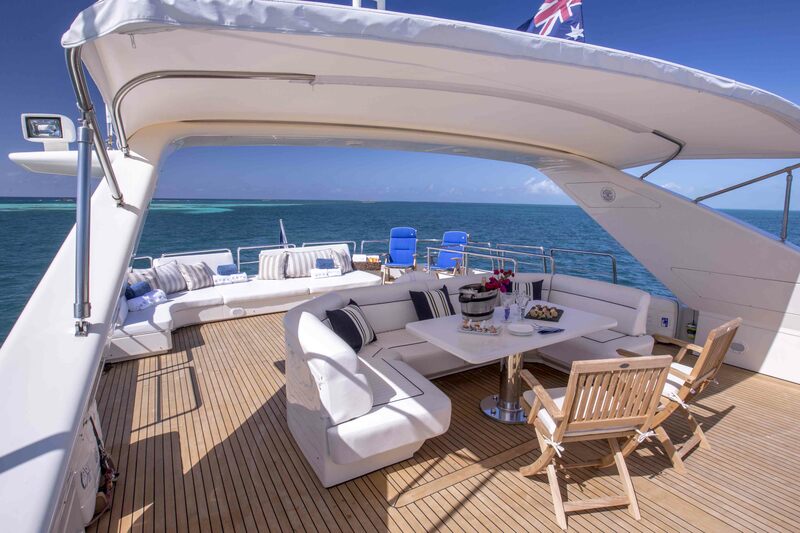 MY MY MY underwent a refit in 2013, she is available for crewed yacht charters in the Caribbean, Bahamas, Florida offering deluxe accommodation for up to 10 guests. 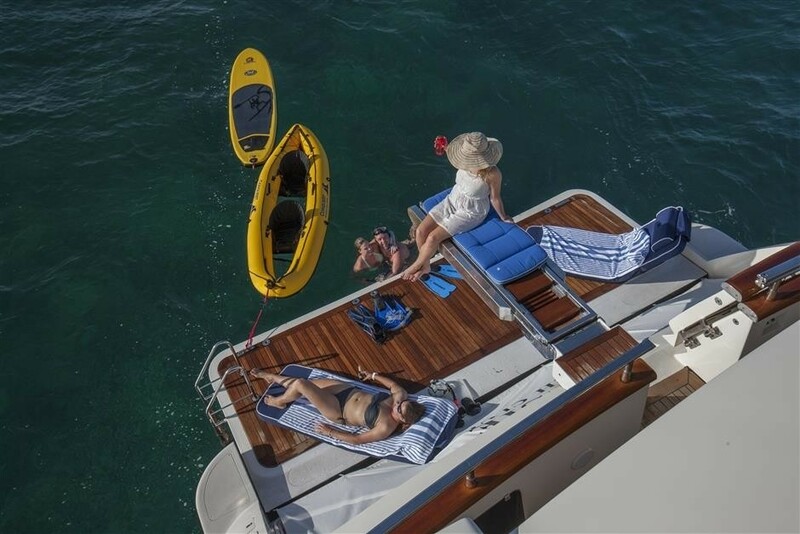 The Azimut 100 Jumbo MY MY MY boasts an open airy interior, with a subtle earth toned neutral décor. 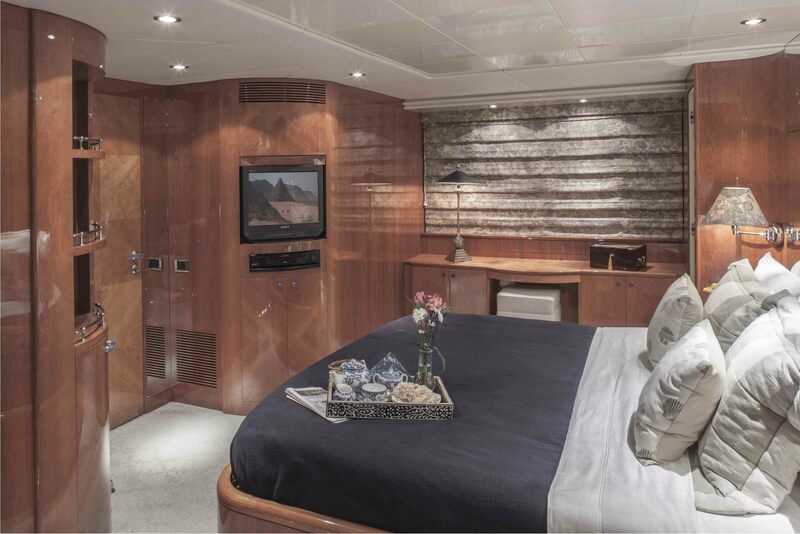 A perfect blend of high gloss woods, fine marbles and modern furnishings create a welcome, soothing ambiance. 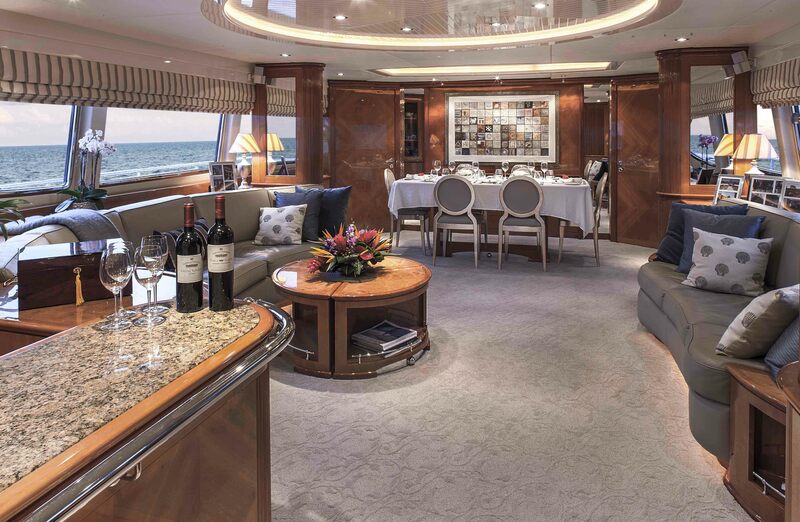 The salon and dining is a contemporary open plan and features a full marble topped wet bar aft, opposing leather sofas with a coffee table centered and formal dining table for 10 forward. 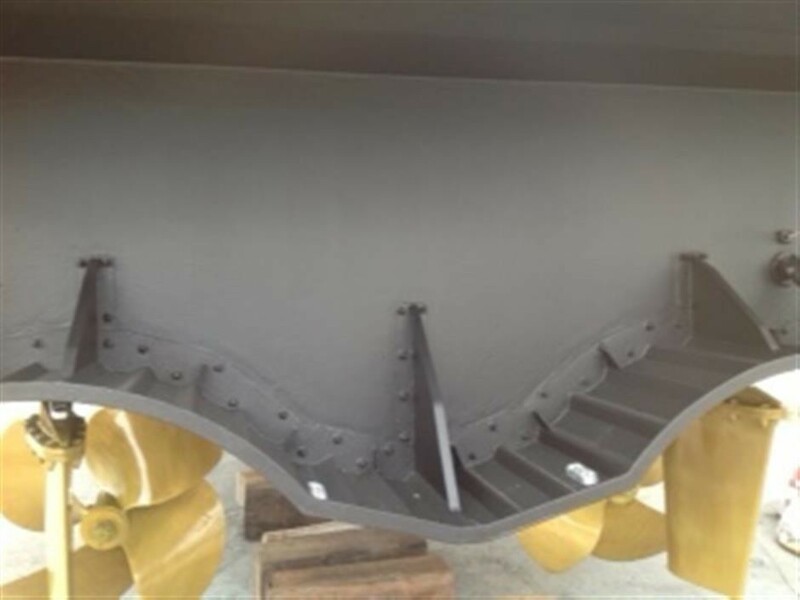 A day head is available on the port side forward. 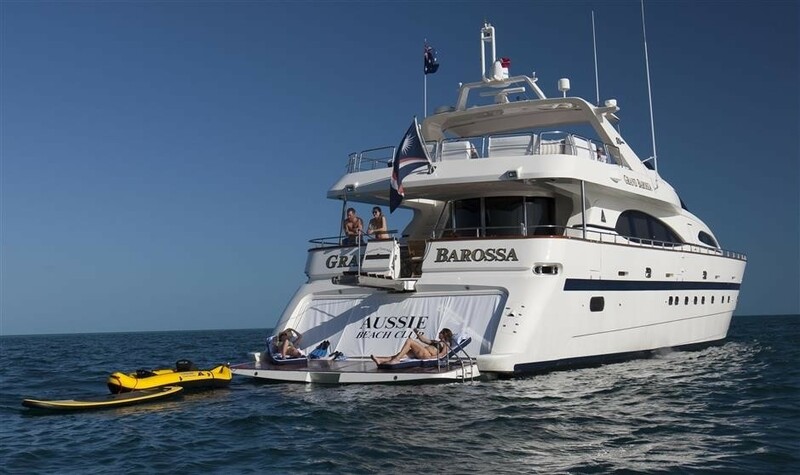 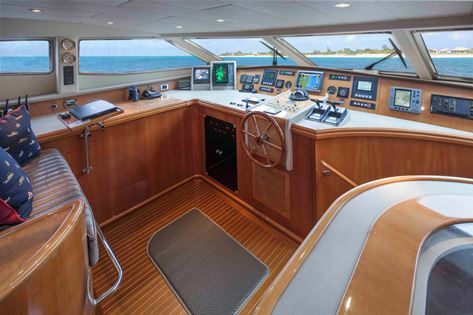 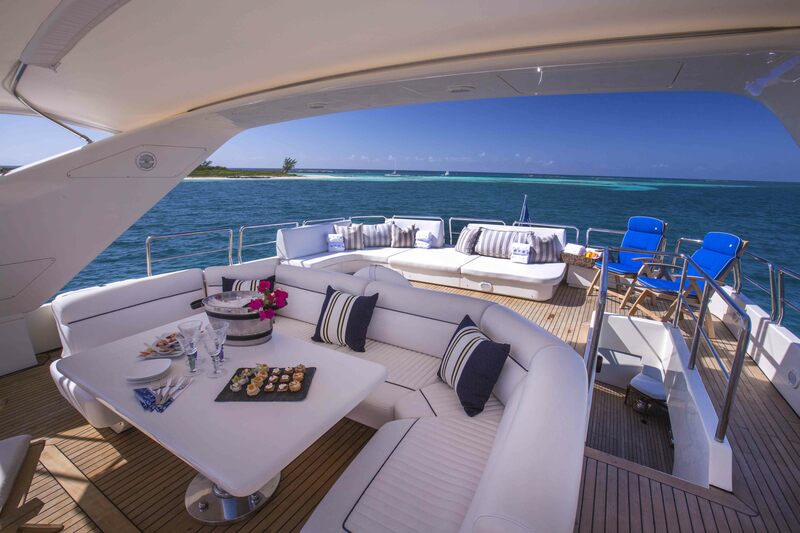 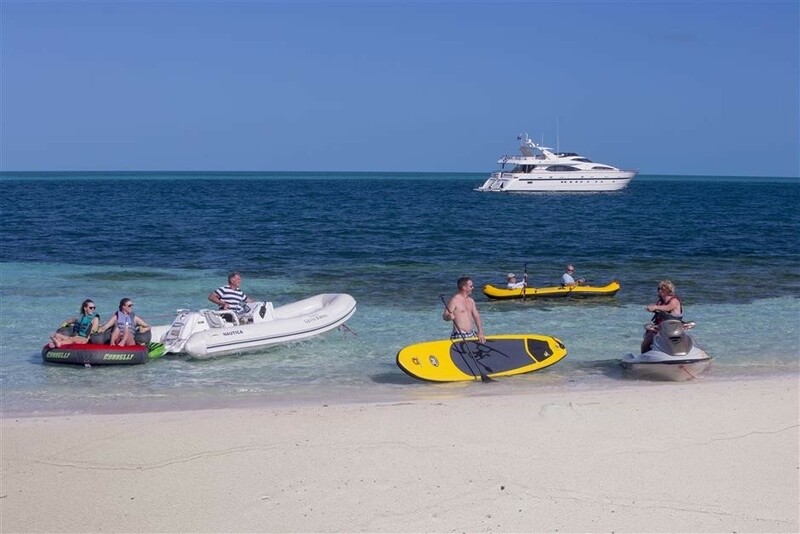 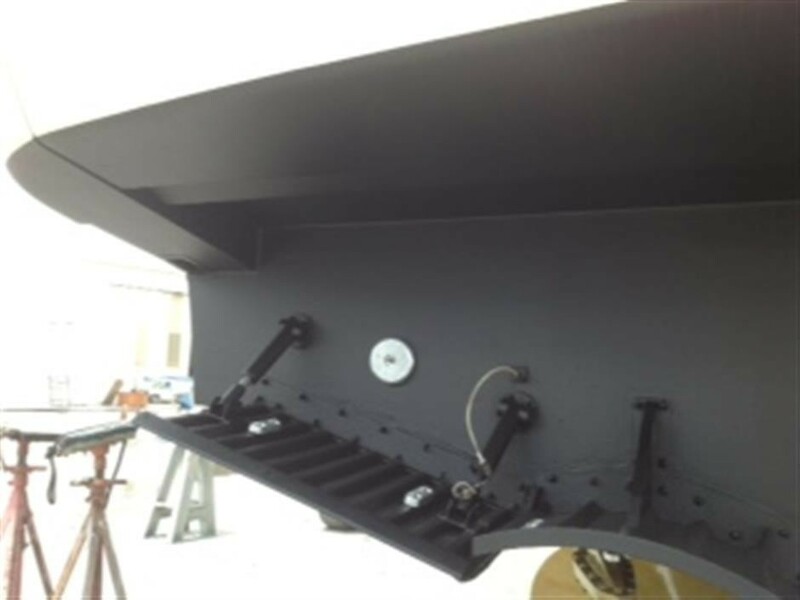 The MY MY MY yacht offers full entertainment systems and state of the art electronics, ensuring optimum enjoyment. 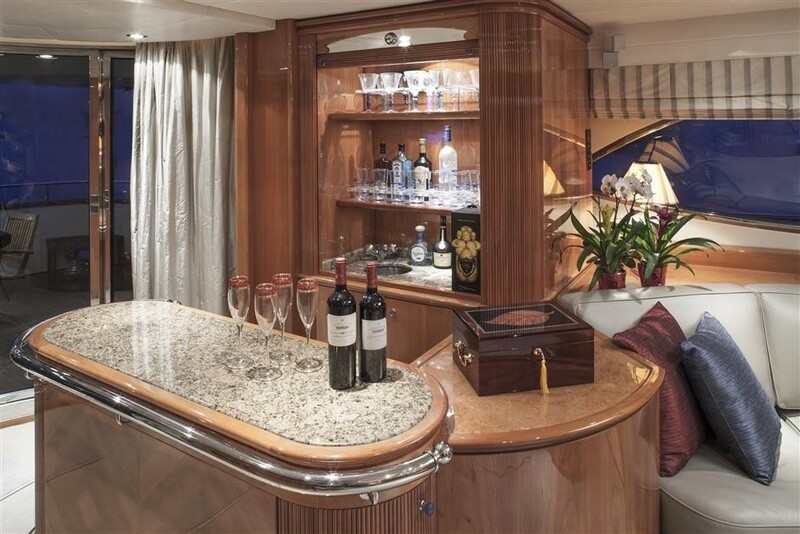 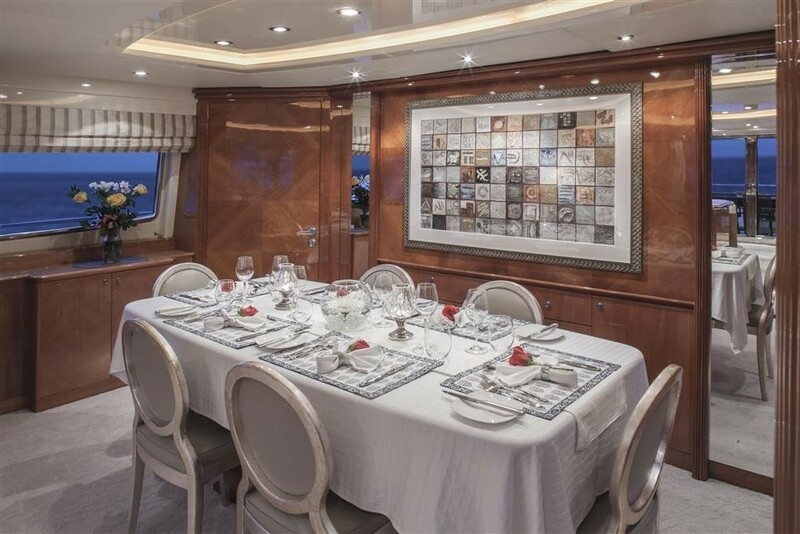 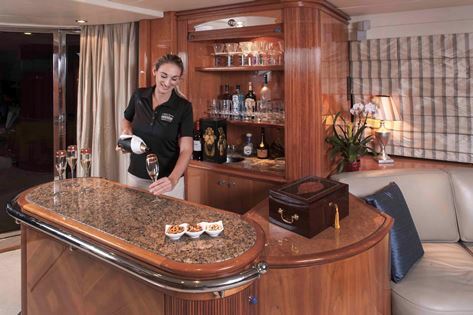 On the main deck forward of the salon, is the upper master cabin, while below decks is the lower master stateroom, VIP cabin and 2 guest cabins. 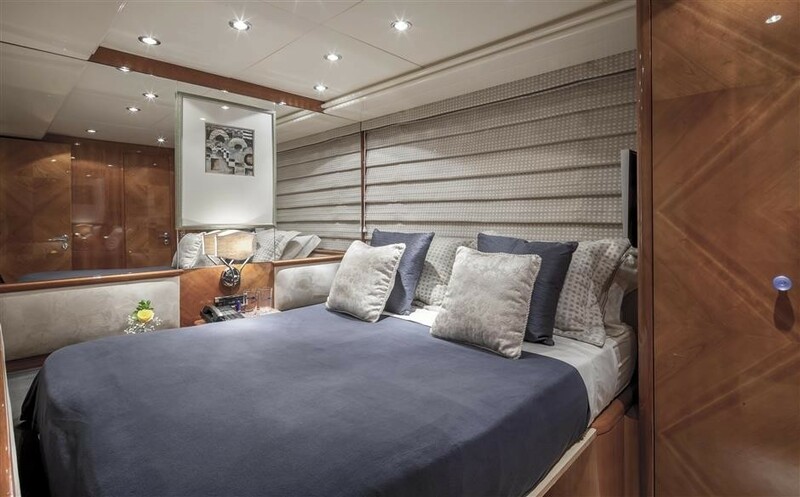 Crewed charter yacht MY MY MY is the ideal choice for enjoying capacious exterior living space. 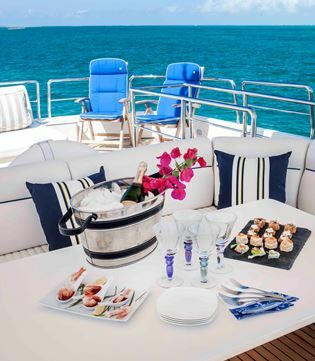 On the main deck, the salon leads out onto a shaded aft deck, with ample seating and an alfresco dining option. 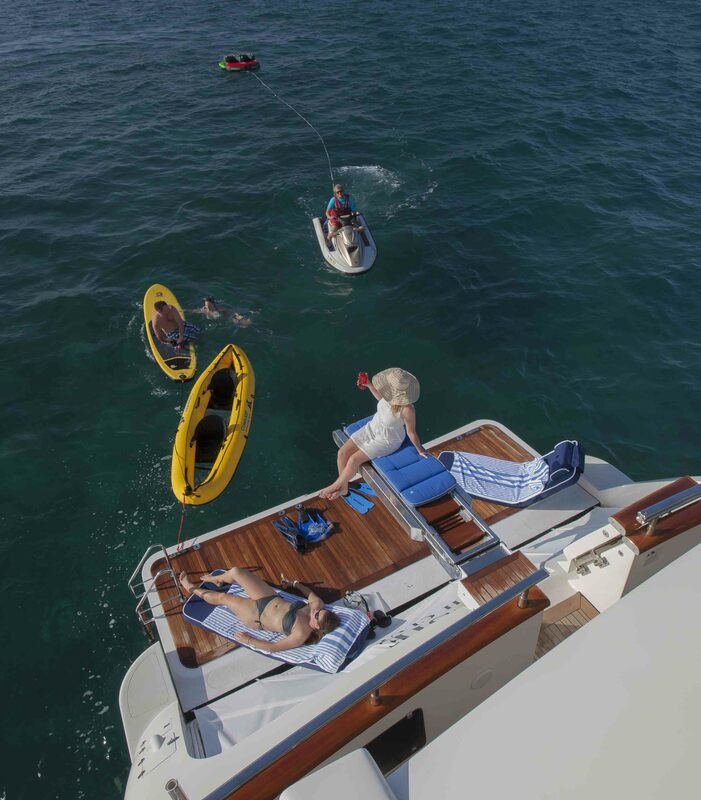 Further aft, a central gate leads to the extended swim platform, which when the water toys are out of the built in garage, becomes the perfect teak beach. 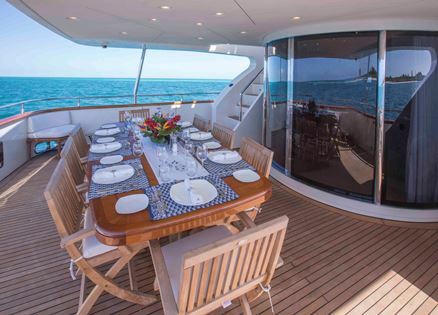 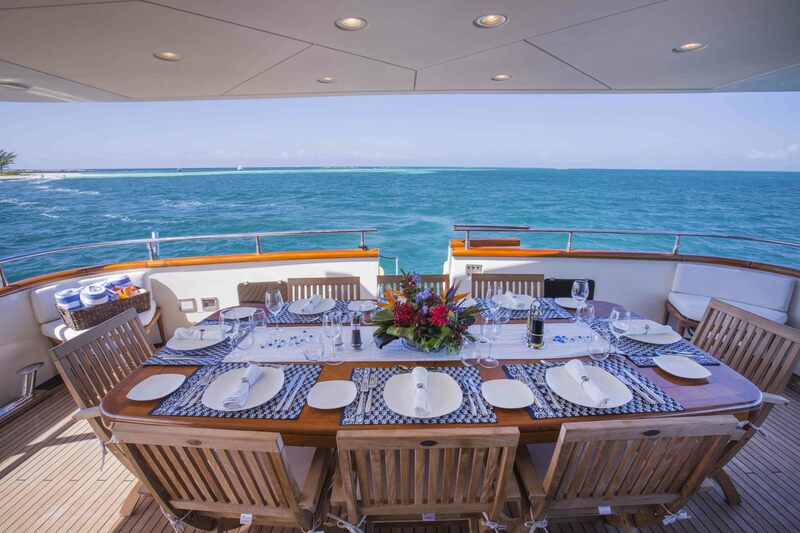 MY MY MY’s wrap around main deck allows guests to wander forward where sunpads await. 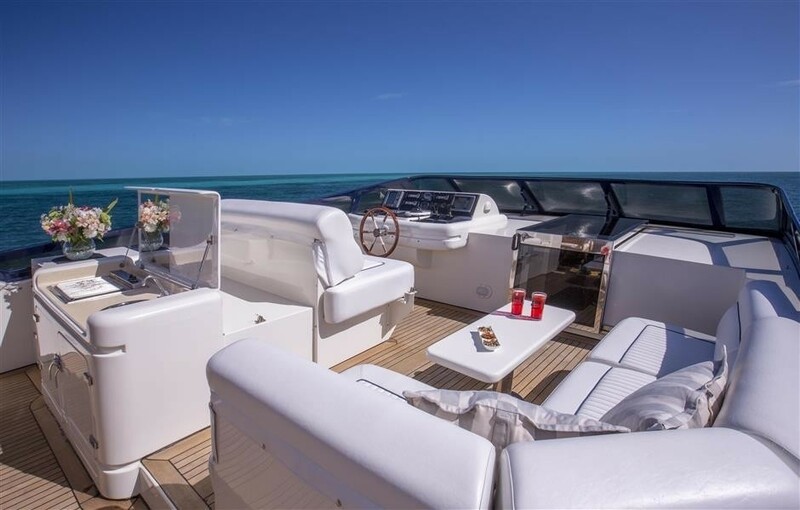 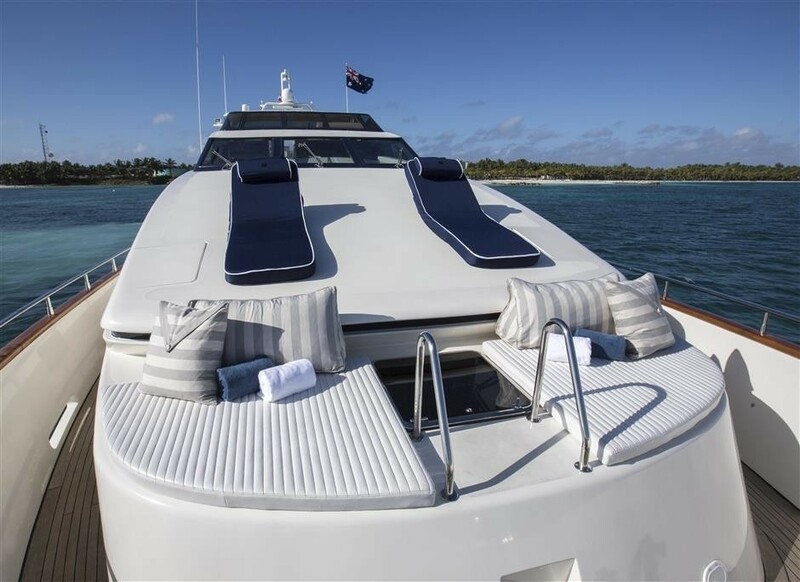 Above the main deck is a well-appointed sundeck, complete with helm station, seating area forward with a small table, full BBQ/wet bar service center, shaded alfresco dining option and generous sunning area with chaise lounges and additional sunpads. 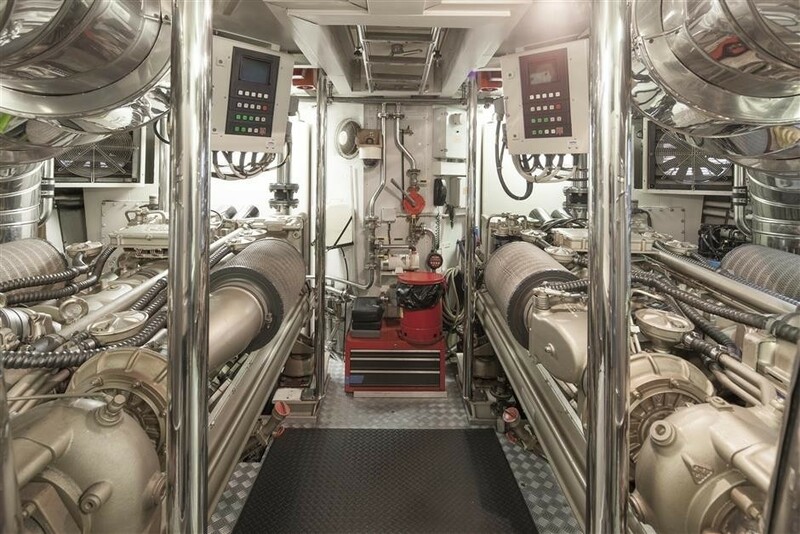 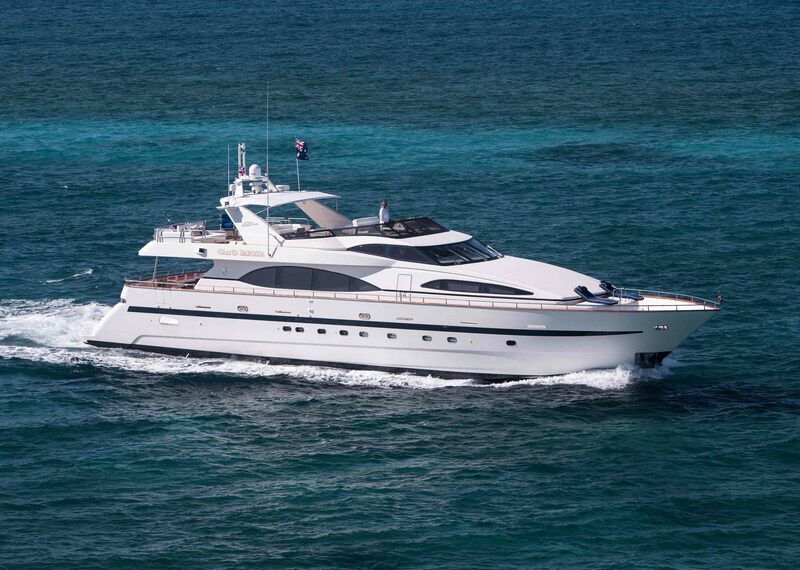 M/Y MY MY is powered by 2 x 1850hp MTU engines, capable of cruising at 18 knots, while reaching top speeds of 22 knots. 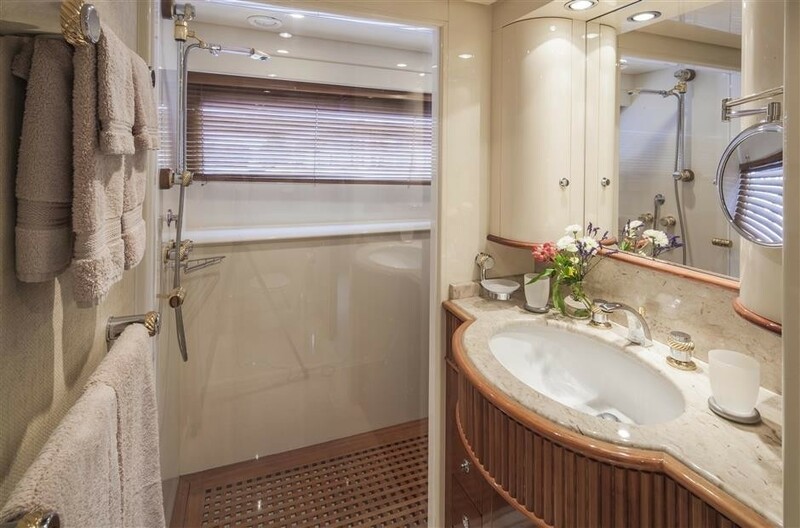 Luxury crewed charter yacht MY MY offers spacious accommodation in 5 cabins, each with en-suite facilities, for up to 10 charter guests. 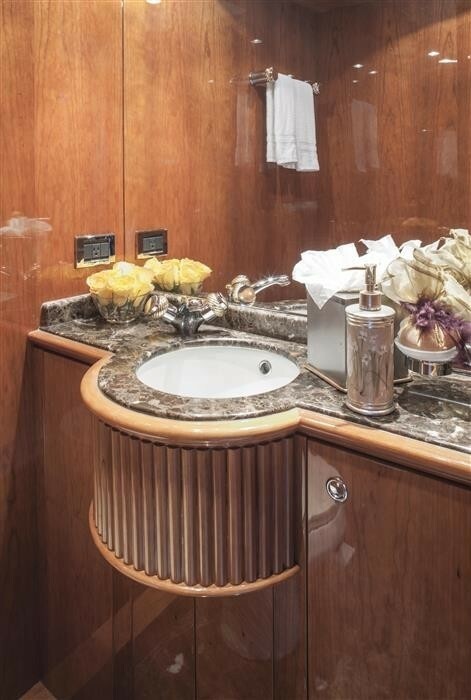 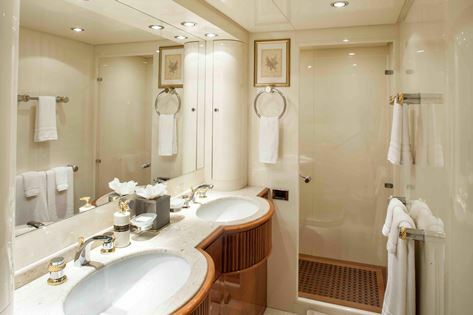 The master stateroom is below decks, with a center lined king size bed, sofa, vanity and en-suite with his and hers sinks. 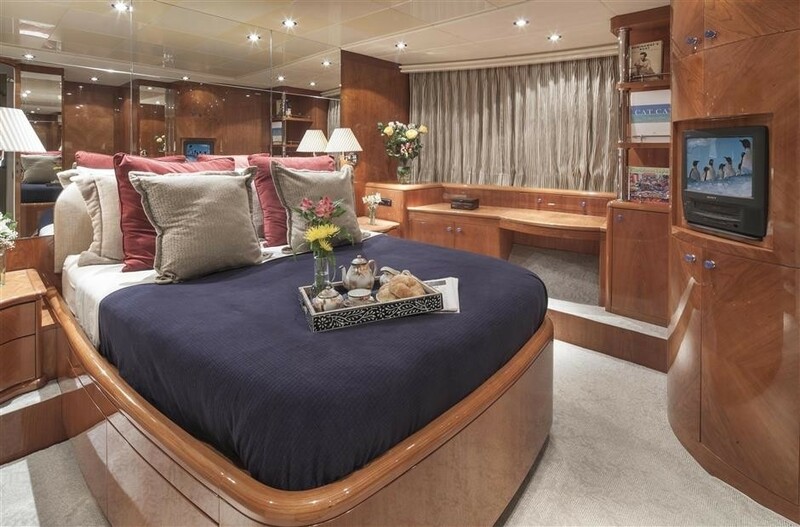 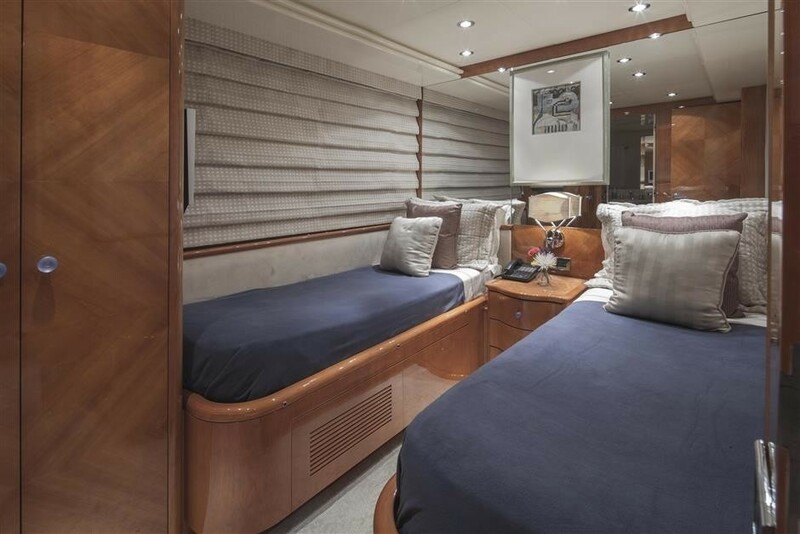 A second master cabin is on the main deck, forward of the salon, with a center lined queen size bed, sofa and vanity. 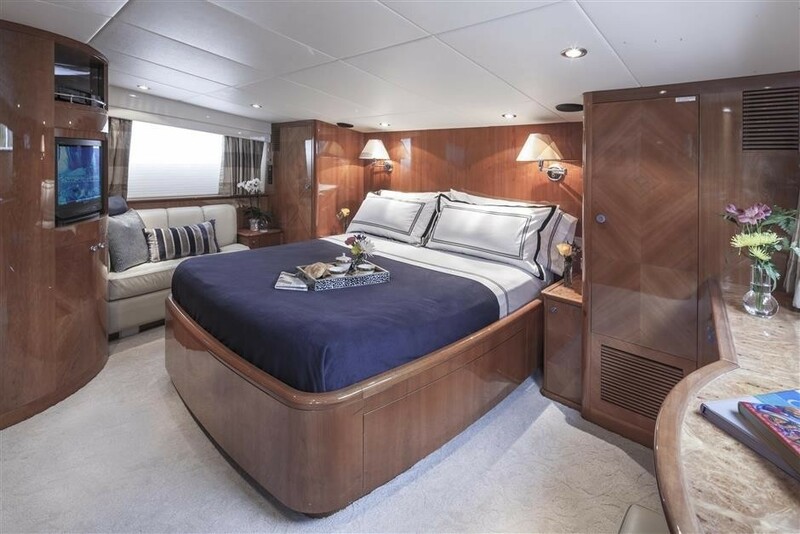 The VIP cabin offers a center lined queen size bed and vanity; while a further 2 guest cabins each have side by side twin beds. Both twin cabins are easily converted into double bed cabins, boasting fabulous accommodation versatility. 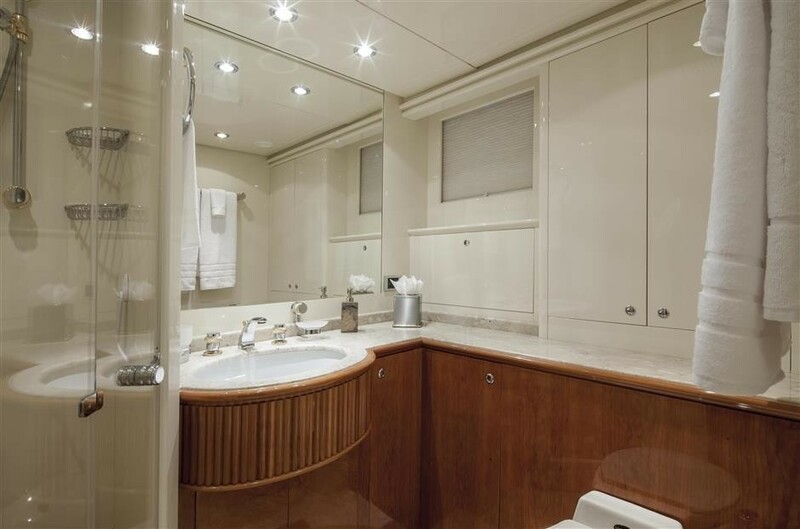 The cabin are all light with a relaxing neutral décor, all guests cabins have full entertainment systems.